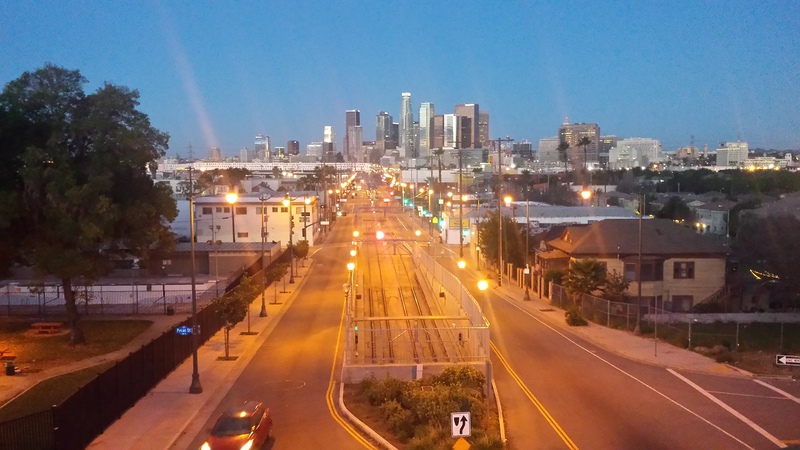 ART OF TRANSIT: Nice shot looking west on 1st Street and the Gold Line tracks in Boyle Heights taken by Patrick Chandler of Caltrans. The new platform for the Silver Line and Foothill Transit buses will run perpendicular to the Patsaouras Bus Plaza and along the El Monte Busway. It should be an easier connection to the East Portal of Union Station and the Red/Purple Line than the current Silver Line boarding plaza at Alameda and the beginning of the El Monte Busway. Work is slated to begin this spring, with project completion in late 2016. Not exactly a major scoop but in interviews with the mayors of Seattle and San Francisco, one point kept coming up time and again: cities need federal dollars to build/rebuild their infrastructure. In fact, the new bus platform described above is getting some federal money. The U.S. Conference of Mayors is meeting in Washington this week and infrastructure, says the Post, will be one of the major themes. The challenge, of course, is that the federal Highway Trust Fund is running out of money (gas taxes haven’t been raised since 1993) and no one in Congress has really come up with a solution on how to steer more federal money back to cities (perhaps a better way of saying it is that no one has come up with a solution that enough Congressmen can agree on). As the Census Bureau noted in 2012, the United States is becoming increasingly urbanized — with nearly 81 percent of its residents living in cities. The Los Angeles-Long Beach-Anaheim metropolitan area, as defined by the Census Bureau, is the nation’s densest metro area with about 7,000 people per square mile and the San Francisco-Oakland area is No. 2 at about 6,266 people per square mile. Of course, parts of Manhattan are much, much denser but the New York metro area on the whole isn’t quite as dense. Unless The Hipsters stage a massive back-to-the-farm revolt, I don’t think this trend is going to change anytime soon. Nothing against rural electrification (sorry, Smallville and John Mellencamp) but seems like spending money where most Americans live or will be living makes kind of sense. Coverage of last week’s meeting at the Puente Learning Center to discuss a Metro joint develop plan at the plaza that surrounds a Gold Line station in Boyle Heights. The development proposal involved an eight-story building that would have included medical offices, shops, a gym and six levels of parking. Residents complained about the size and scale of project and lack of affordable housing. Although construction was not imminent, Metro has said it will start over with the planning process and make a greater effort to keep the community informed and involved. Times scribe Esmeralda Bermudez also does a nice job folding in some helpful context about the Boyle Heights community and some of the very real fear there over gentrification and rising housing costs (which is also an issue, of course, in many Southern California neighborhoods these days). The gist of it: the more BRT stations look like rail stations, the more CityLab says they work best and attract passengers. The only BRT line in the U.S. to be included is the Metro Orange Line. Of course, there’s not a lot of competition in the U.S. Even BRT is far less expensive than building rail, Americans (and American politicians) have shown little appetite for it thus far, perhaps because BRT often means losing a general traffic or parking lane. Of course, that sometimes happens with rail, too — the Expo Line will run down part of Colorado Avenue in Santa Monica when it opens next year and that means less room for cars. No one, thus far, is having too much of a cow over it — and the one-block walk from the Downtown Santa Monica Station to Fritto Misto (gnocchi + basil pesto + pine nuts) seems tolerable. A lot of you will be heading out to watch the Super Bowl next week while also enjoying an adult beverage. Please consider taking Metro if so to avoid driving impaired — Metro Rail makes it pretty easy to reach DTLA, Hollywood, NoHo, Highland Park, Old Pasadena, downtown Long Beach and K-Town, among others. Our unofficial pick: New England 17, Seattle 16. Maps and timetables here. Would totally take you up on it if I still lived in LA! “East Japan Railway Co’s gross profit for the three months ended in Sep. 2014 was $2,436 Mil. East Japan Railway Co’s gross profit for the trailing twelve months (TTM) ended in Sep. 2014 was $8,830 Mil. Public transit does not work. It’s time to look at privatization. Has anyone at Metro ever consulted the people who are studying this matter over at UCLA? Surely, if you guys believe in scientists in professors about climate change, you should start listening to scientists and professors regarding how to run transit, no?